Welcome to Luna Counseling, located in Springfield, OH. Luna Counseling was founded by me, Jordan Prebys, with the goal of providing new and different avenues for healing and growth. My practice focuses on more unique modes of therapy that fit well with the notions of depth psychology. 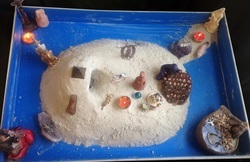 Through utilizing more creative forms of therapy, coupled with traditional therapy models, I integrate the mind, body and spirit to help clients; these methods include sand tray therapy, hypnotherapy and play therapy. Traditional talk therapy utilizes the analytical areas of the brain, whereas these creative modalities integrate both hemispheres of the brain, as well as the lower brain stem all the way up to the frontal cortex.